Looks like this is shot on the beach right? Well, there is no beach in my City, Jaipur. Its just that one can pull off such shots by finding puddles of water post rains. That is exactly what I did. I found this large puddle of water at SMS Stadium, Jaipur. There was a lot of clutter being reflected in the puddle. I took a full 360 degree view and walked around the entire puddle to find interesting reflections. 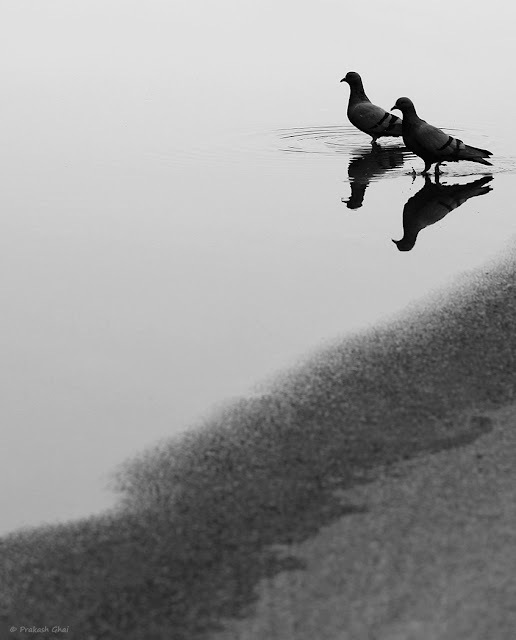 I spotted a reflection of a Street Lamp to begin with and within in a few seconds, these two Love Birds/Pigeons Flew onto the Water Puddle. There is an Old Zen Saying that says "When the student is ready, the master appears." If one relates that to Photography it could mean "When the Photographer is ready, the subject appears." Yes, indeed The Subject appeared when I was ready. It has happened with me a lot of times before. Once I had my subject ready, I decided to shoot this in the Vertical/ Portrait mode. That helped me remove some unwanted elements from the frame. I also cropped this photograph to further reduce clutter. Why I liked the subject despite being very common? was because these birds signify Relationship /Companionship / Love. That was the first appeal. The second was their reflection in water. In the Minimalist Composition above, I have also left a lot of Negative Space and followed the obvious Rule of Thirds. One important point to note is that, here we have 3 shades or 3 tones of color i.e Light / Medium / Dark. That really pops a Black and White Photograph. The same principle is followed in Pencil Shading. The 3 Light/ Medium and Dark tones are the basics of Pencil Shading. I did learn a bit about it last year. ...and the Minimalist or rather maybe not so Minimalist Description. This post...<3 <3 just awesome. hats off to the blogger! !